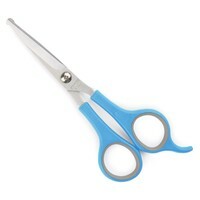 Suitable for both your dog and cat, these scissors are great for trimming around the eyes, ears and face efficiently and safely. A finger rest has been added for extra comfort and control. Full advice on cutting and grooming your pet is on the reverse of the products packaging.